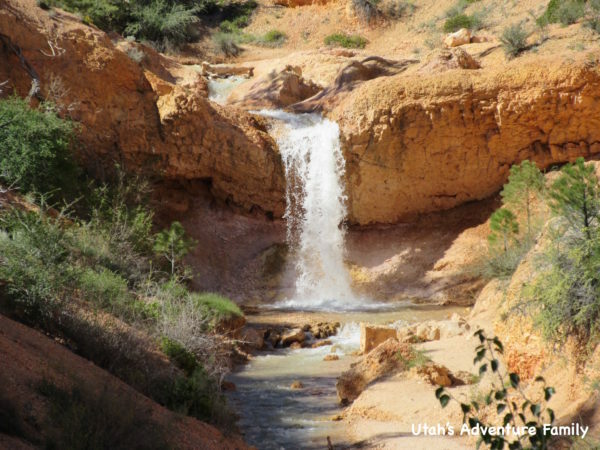 Even though Utah is a desert environment, it is filled with many beautiful waterfalls. 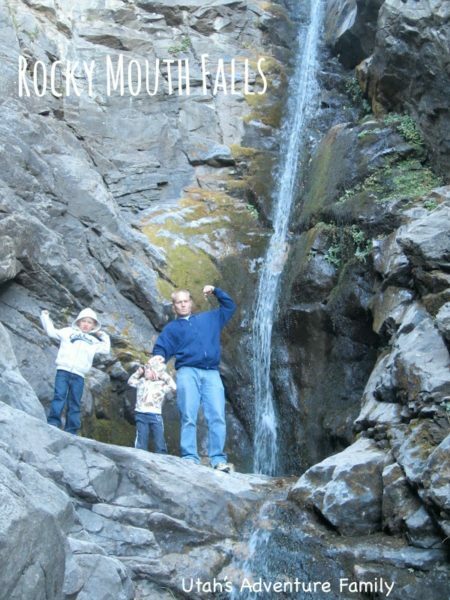 Lots of these waterfalls are long distance hikes which end up being way too far for our little hikers! 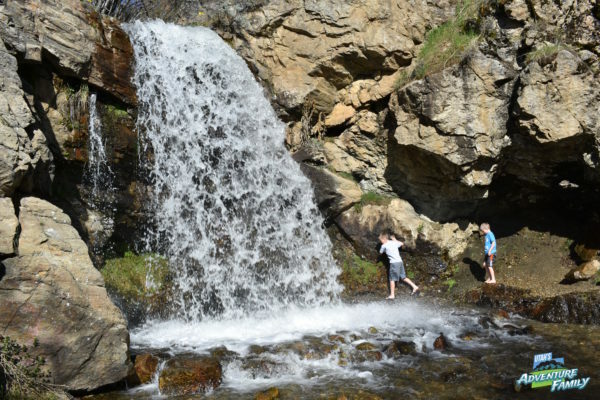 But even if your family isn’t ready to hike to Calf Creek or even Adam’s Canyon, there are still a lot of waterfalls accessible to you. 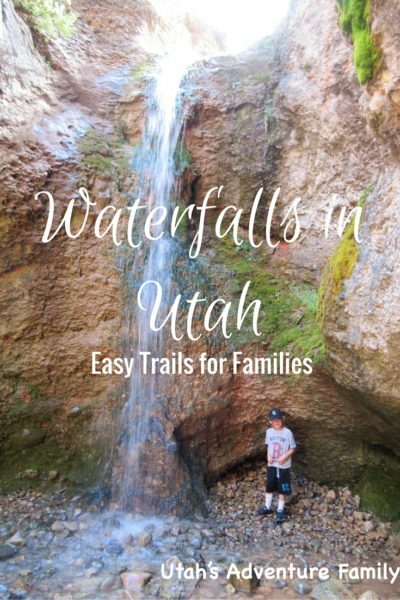 We have put this list together to show you that there are lots of fun EASY waterfall hikes in Utah for your family. You can watch us on Studio 5 talk about these waterfalls, or scroll down to see our full list. 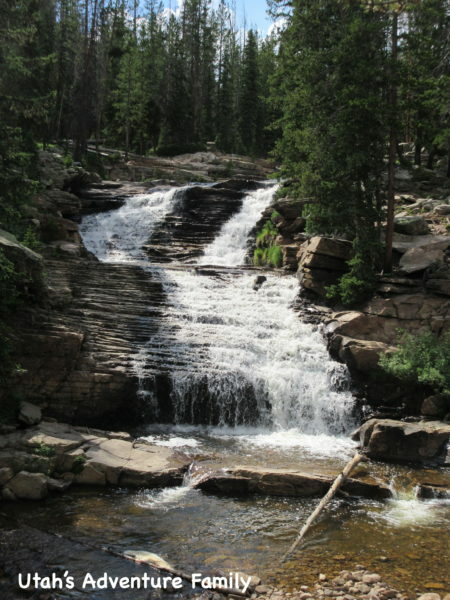 Provo River Falls is located on the Mirror Lake Highway, which costs $6 to drive, but there is so much to do for families up in the Uintah Mountains it is worth the fee (Check out our list of things to do on the Mirror Lake highway). This waterfall is an overlook. It’s that simple! There are a few stairs to a beautiful view of the waterfall. If you walk down the trail along the river, you will find a few places where you can get your feet wet (or throw rocks if you have boys like ours). This is a wonderful waterfall for any family. This trail varies in distance depending on how far you walk along the river. We probably walked less than 1/4 mile total. 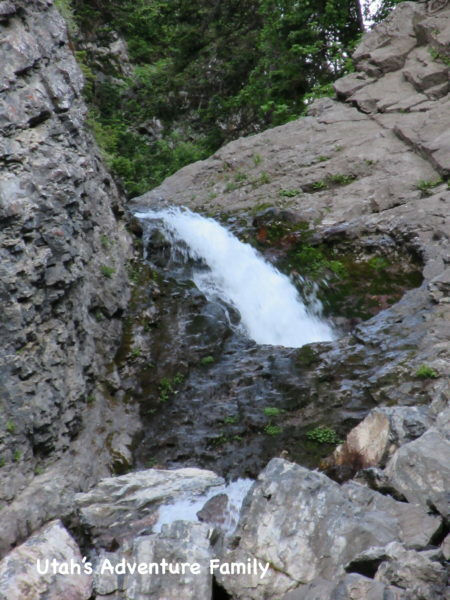 Hidden Falls is a short walk found on the S curve in Big Cottonwood Canyon. It is probably less than 5 minutes over to this fun little waterfall. Our kids loved standing by the waterfall and feeling the spray on their faces. You will often see rock climbers here, and you can peer down into an old abandoned mine. If you take the drive up Big Cottonwood Canyon, this is a must! 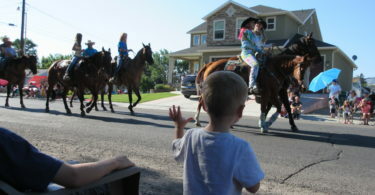 It’s a flat, easy hike that is under a quarter mile roundtrip. Mill B South Interpretive Trail is in the neighboring parking lot to Hidden Falls. This hike is paved so you could push a stroller or wheelchair, but remember it is still an uphill climb to the waterfall. The trail is beautiful as it walk along the river flowing down the canyon and as you come to the end of the pavement you will see a bridge where a waterfall flows underneath. We also like to continue past the waterfall for a short distance where you can climb around some mud and over rocks to see a big cascade of water in the river. Mill B South Interpretive Trail is 0.75 mile. Donut Falls is a very popular hiking trail. In the summer the parking lot for this trail can fill up quickly, which means a longer hike as you have to park further back along the road, so we recommend going early in the morning and during the week if possible, especially if you plan on hiking in the summer. The trail to Donut Falls is beautiful. 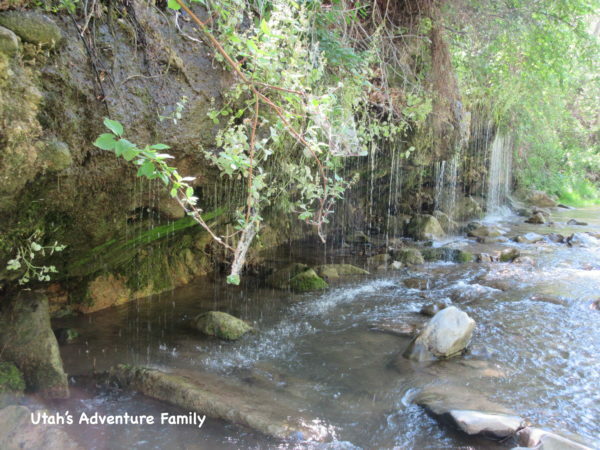 We love crossing the river a few times, and the best part is ending at such a fun waterfall. You can see how the water falls into the donut shaped rock, and then it will come out below. Donut Falls is a 1.5 miles round trip from the trailhead. Lisa Falls is a unique waterfall and a super short hike. The trail is short, but it does have a lot of big rocks, so watch your little ones. 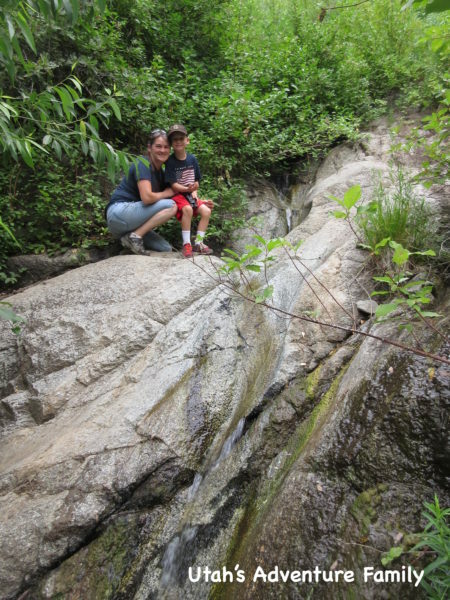 We love that you can walk right up to the waterfall and touch it as it cascades down the mountain sideways. 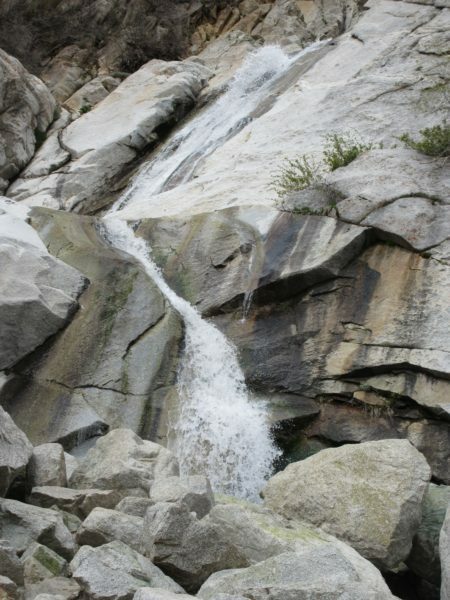 This waterfall is located in Little Cottonwood Canyon which has lots of beautiful hikes and scenery. Lisa Falls Hike is 0.3 mile roundtrip. This waterfall is located behind a neighborhood in Sandy. You walk up some stairs, through the neighborhood, and onto the Rocky Mouth Falls trail. The trail is short with a little bit of a climb to the waterfall. Our boys loved the “caves” to explore along the way, and when you arrive at the falls, you can climb right up next to them if you are careful on the slippery rocks. We have done this hike in spring, summer, and fall, and we have loved it every time. 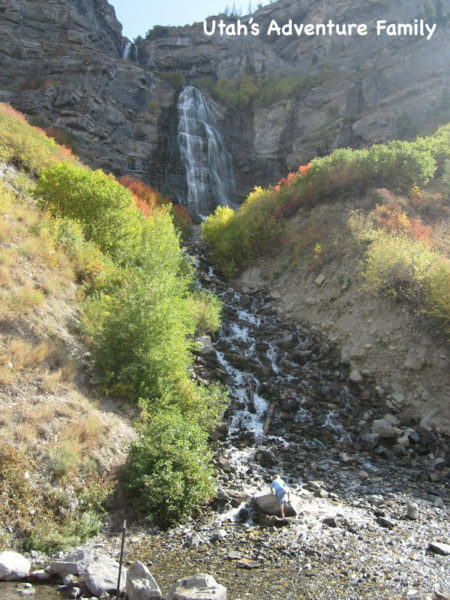 Ghost Falls is located behind the LDS Draper temple in Corner Canyon. 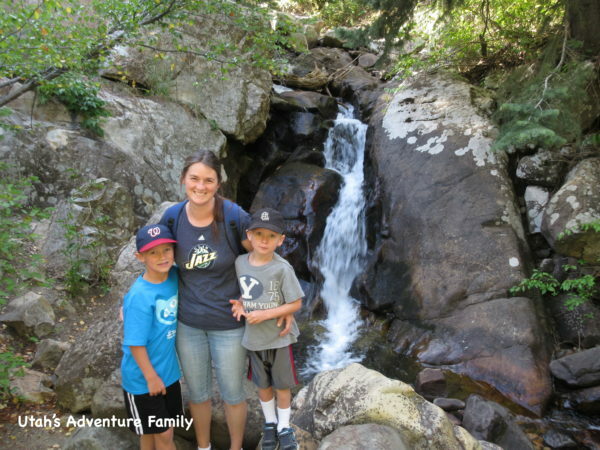 We had a little bit of a tricky time finding the falls, so we have written some specific directions to help you find this small waterfall that our boys loved. Ghost Falls is about 3 miles, but extremely flat, or you can hike from the other side and it’s 1.8 miles round trip, but you have a little steeper climb back up from the falls. Cascade Springs is on the Alpine Loop and is stroller friendly. There are boardwalks that walk over little pools where you can spot frogs, fish, butterflies, and birds. As you wind your way along the boardwalk, you will come to a beautiful waterfall. Located in Pleasant Grove, at the same trailhead as the “G” hike, Battlecreek Falls is a popular waterfall hike. The trail is wide and has a slow, steady climb up to the falls. 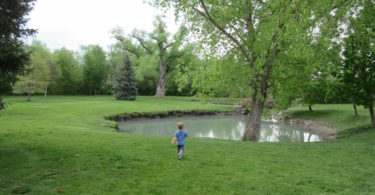 We love walking alongside the river, throwing rocks into the holding pond, and stopping at the small “cave” along the trail to Battlecreek Falls. The falls fall into a little stream that is fun for playing and wading in once you arrive at the waterfall. You can also walk above the falls further along the trail (we have never tried this). Battle Creek Falls is 1.5 miles roundtrip. Probably one of the most well known waterfalls in Utah is Bridal Veil Falls. This delicate waterfall has a paved trail that leads to the small pool below. 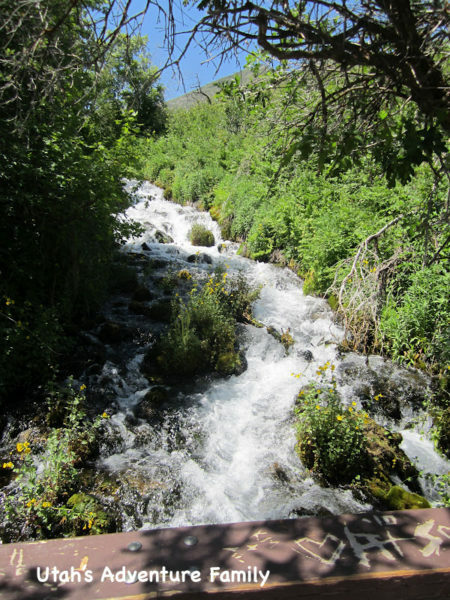 We love walking in the shallow water and enjoying beautiful Provo Canyon. There is also a small fish pond where you can feed the fish (bring a quarter for food). This hike is very short from the parking area (less than 1/4 mile). 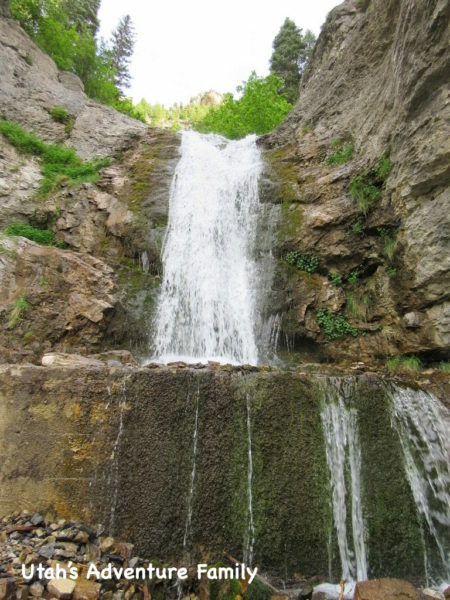 Upper Falls is located in Provo Canyon. 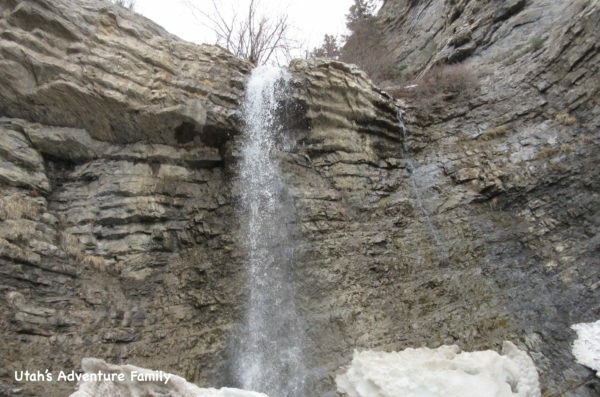 Most Utahns have heard of Bridal Veil Falls, listed above, but just a mile north is an amazing waterfall that no one ever sees. Upper Falls is a 40 foot waterfall that you can enjoy alone. The trail is a steep climb, but Upper Falls is only 0.6 miles roundtrip. Dripping Rock isn’t technically a waterfall, but it is a family favorite place to cool off in the summer. And great news, this trail is paved! So you can push little ones in a stroller. You begin by the golf course in Spanish Fork and walk through a tunnel under the road to the trail that follows the river. As you walk, you will hear the water dripping from the banks of the river. The largest area of Dripping Rocks has a small, but steep walk down to the river’s edge so you can wade across the river and right behind the dripping water. This trail is 1.0 miles round trip. Grotto Falls is the hike that we take all of our friends to visit. The hike is beautiful, but flat and easy. It walks through the shaded trees, and crosses the stream quite a few times which is a huge highlight for kids. After 1/4 mile you come to the waterfall that has carved it’s own grotto. The waterfall has a very shallow pool that is fun to wade in and you can walk right under the waterfall if you want! This trail is 0.5 mile round trip. 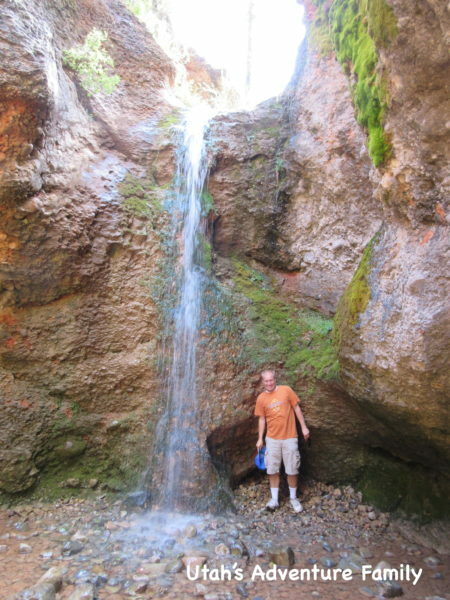 Adam’s Canyon has two waterfalls. This waterfall is the Lower Falls and is only about 1.5 miles roundtrip. This waterfall almost received a moderate rating because it starts with a steep climb up the mountain. There are 10 switchbacks, but after these switchbacks the trail evens out, and there is just a little bit of climbing down to the waterfall. 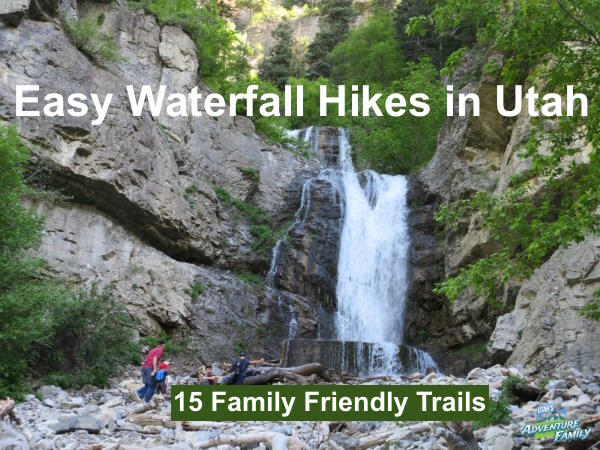 We decided to put it on the Easy Waterfall list because the waterfall is definitely worth the climb at the beginning, and our 4 year old hiked it better than we did! This waterfall is beautiful, and you can even walk right behind it! This trail is located near Bryce Canyon along Scenic Highway 12. This trail leads to a small alcove (not much of a cave), but you also pass a beautiful waterfall along the way. In order to get close, you have leave to the trail, which we did not do. There we many people who did venture closer though. We loved this trail because you can dip your feet in the river that runs right along the trail. Mossy Cave and Waterfall are 0.8 mile round trip. 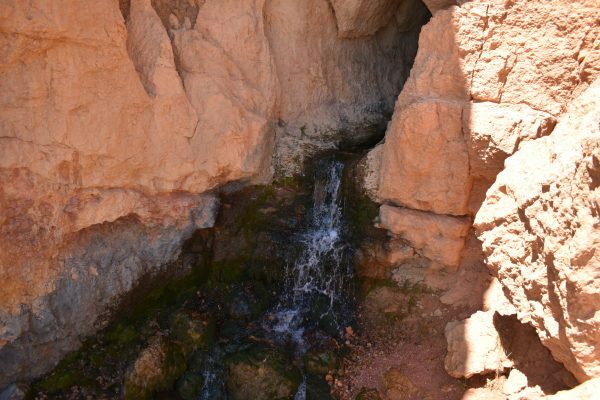 This small waterfall (like trickle of a waterfall) is a fun little trail located east of Cedar City near Duck Creek. We enjoyed the hike more than the falls, and it’s a simple 1.0 mile RT trail. There is no shade, so avoid the heat of the day. 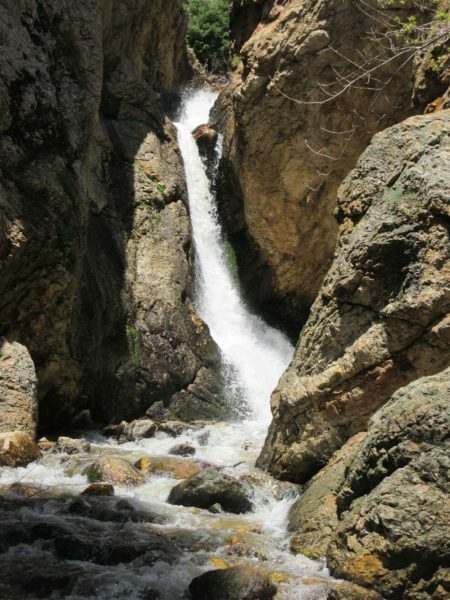 And we recommend this hike for Spring when the falls will be larger. The neat thing is that the Cascade Falls comes directly out of the rock! If you’ve mastered our Easy Waterfall Hikes, try our new list of Moderate Waterfall Hikes! This is so great!! Can’t wait till try all these. My husband and I love hiking but our three girls are light weights so this is perfect. Thanks! Thank you for this info. I saw it on TV about a week or so ago. That is a great info about waterfalls. Which ones are easiest hike that can b done with 1-2 year old kid. The shortest and easiest ones would be Grotto Falls, Lisa Falls, Hidden Falls, and Rocky Mouth (this one being the longest, but not too long). Dripping Rock Trail would be good with a little one too because you could push them in the stroller and then let them get out by the water. These all look so fun!!! Thanks for the awesome list! Thanks for your kind words. We hope you find some hikes you like!